Oatmeal Chocolate Chip Cookies. These cookies are the perfect combination of chewy and crispy with the added wholesome deliciousness of oatmeal and of course a little chocolate indulgence too. Updated October 10, 2018 with new photos and option for metric measurements. It’s the first day of school here in Newfoundland and also the first day of cookie season in the Parsons household and we’re starting the year right with these perfect oatmeal chocolate chip cookies. They are a real kid classic after school snack with a tall glass of cold milk. Most of the time these days, our cookie batches don’t even make it to after school! Both of my kids are in Junior High which is right around the corner from our house, so coming home for lunch with several friends tagging along is a daily occurrence here. Both of my kids are excellent cookie bakers and there are almost always freshly baked cookies available in our counter top cookie jar. From chocolate chip, to oatmeal to peanut butter cookies, it seems at least one of the bakers in this household manage to keep the jar filled. Wonder why we have so many kids visit, huh? These soft, crispy edged, chewy cookies will undoubtedly be made many times during the school year. Have a great school year folks! Like this Perfect Oatmeal Chocolate Chip Cookies recipe? For another all time kid classic after school cookie please check out this decades old family recipe from my Aunt Aggie. 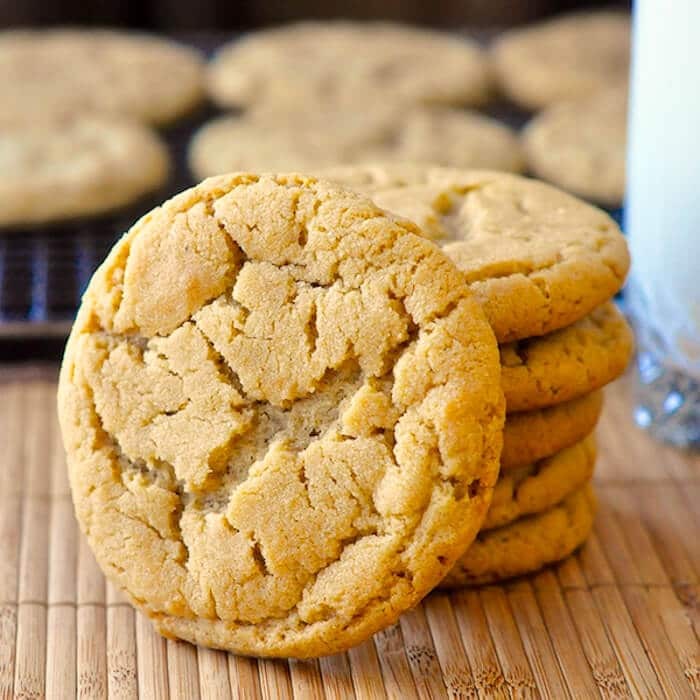 They are The Best Peanut Butter Cookies I’ve ever tried. 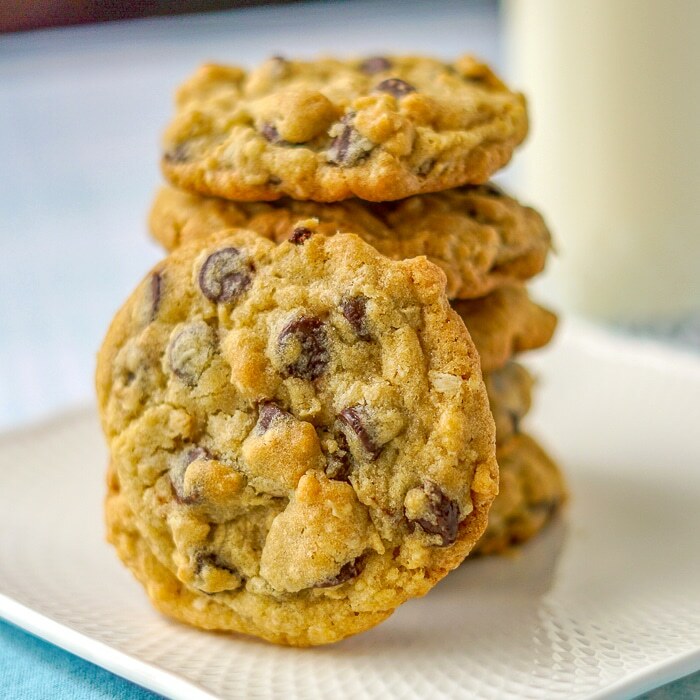 Oatmeal Chocolate Chip Cookies - These cookies are the perfect combination of chewy and crispy with the added wholesome deliciousness of oatmeal and of course a little chocolate indulgence too. In a medium sized bowl whisk together flour, rolled oats, salt, and baking soda. around the edges, about 12-15 minutes, depending on cookie size. I think I need to add these to the care packages I’m sending to my college girls…they look perfect! 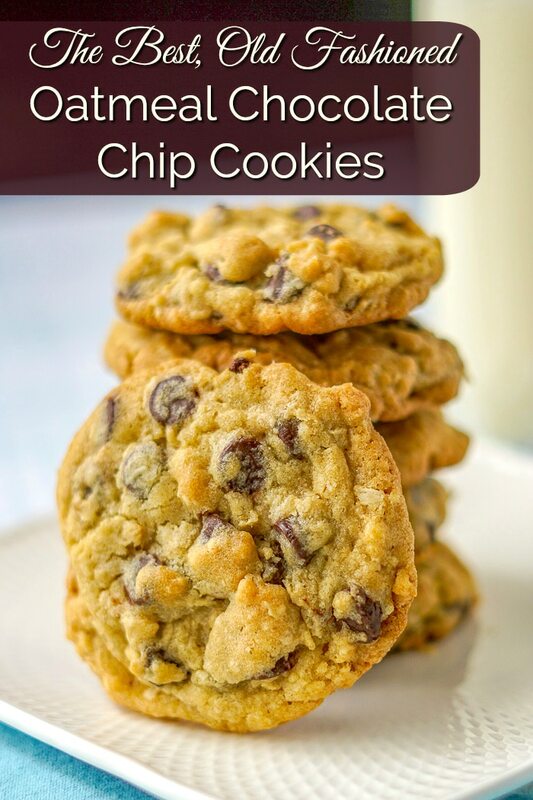 Just wanted to say thanks– this is now my go to chocolate chip cookie recipe. It’s exactly how I love my cookies, chewy and crisp at the edges, and strongly vanilla flavored. Making it for the third time today. Thanks for posting it! These are amazing!! I left out about 2 tbsp. of both brown and white sugar because i used smarties instead of choc. chips. soooo yummy and soft and chewy. this will be a go-to recipe from now on. thanks! My daughter loves using M&M’s in hers. She sometimes uses them and chocolate chips! She likes to go overboard sometimes, like her old man. LOL! These are so effin yummy! Chewy yet crisp – and I even used a gluten free flour! Superb! Thank you for posting! Impossible to eat just one. They really are the best. So glad you love them too. You had me at, “It’s the first day of school here in Newfoundland…”. As a resident Maritimer living in Ontario for about, ooh, two years too long now, I needed a little home. So I’ll be making these tonight for another Maritime friend coming over for a little kiddo play time, and I already know they’re going to be the best chocolate cookies I’m ever going to make because I’ve never known a food to come out of NFLD that wasn’t the best thing I’ve ever tasted. Mine did not flatten what wonder why? They still taste good but not thin crispy and chewy. I replaced the butter for margarine I wonder if that’s the problem. I tried these today. I am not a baker but how could I go wrong right? Well I did. They are not at all like your picture. Not soft and chewy. More round and dry. They stayed the same shape as when I placed them on the tray. Where did I wrong? They are tasty though!!!! Help!!! It sounds like me you overmeasured the flour. Spoon flour into the measuring cup and level the top with the back of a knife. Using a measuring cup to scoop flour out of the bag, often compacts the flour, causing an over measurement.Also if you used anything but real butter, I cannot vouch for how any baking recipe will turn out. Hi Barry: I have not tried your chocolate oatmeal cookies yet but have tried most of the cookies, squares and they are super delicious. Visited Newfound last year on a tour and all the food was great. Thanks so much for all the recipes that you have posted. Is there anything i would need to do differently for high altitude? I live at sea level. No experience with this. Do not melt the butter. Chill in the fridge. I’m thinking ground oatmeal would act like flour and they might be too dry. Can I make these in advance and freeze the dough for later? If i was to do this, how long would I bake from frozen? Thaw dough first. Then treat as normal. Hi Bill! Greetings from chilly Ottawa! I just made these for my three teens and they came out perfectly! They were a real hit! I made mine a bit smaller and they only took 10 mins to bake. Thank you for posting this! Just took them out of the oven…tried one and ABSOLUTELY the best cookie I have ever had!!!! These are awesome, thank you so much for the recipe! I made them gluten free by substituting ground oats* and ground coconut (ground in a coffee grinder) for the flour. I used real butter and a bit of coconut oil/ghee combined. I used 1 cup of coconut sugar rather than half brown and half white., and no vanilla because it’s so expensive now: ( I really miss vanilla! But they were the perfect combination of chewy and crispy, made me feel like a kid again. I put “best oatmeal chocolate chip cookie” into google and this came up on the second page. This should have been first! * Although some people who are gluten intolerant or celiac cannot have oats at all, I don’t find oatmeal bothers me at all so please use your own judgment. I just made these and love them. I used an ice cream scoop to measure and they still kept there shape. Will so be making again. I’ve commented already (don’t see it yet though) but I have made these several times since and I have to say what a perfect recipe this is. I’ve been subbing ground oatmeal and ground coconut for the flour and using about 3/4 cup coconut sugar (no white sugar at all). Although it is perfect as is, I was finding it still a bit too sweet for me so today decided to replace some of the sugar with ground flax seeds, and the cookies still came out perfectly. Thank you so much for this recipe, I bake a lot of cookies and this is truly the best and easiest to bake and experiment with recipe I have ever found. After 50 some odd years I had managed to lose my mom’s oatmeal chocolate chip cookie recipe. I jumped on Pinterest and started scrolling thru photos looking for the ones that looked like mom’s and found your recipe. I made them without any adjustments and they were absolutely perfect! Thanks for sharing!